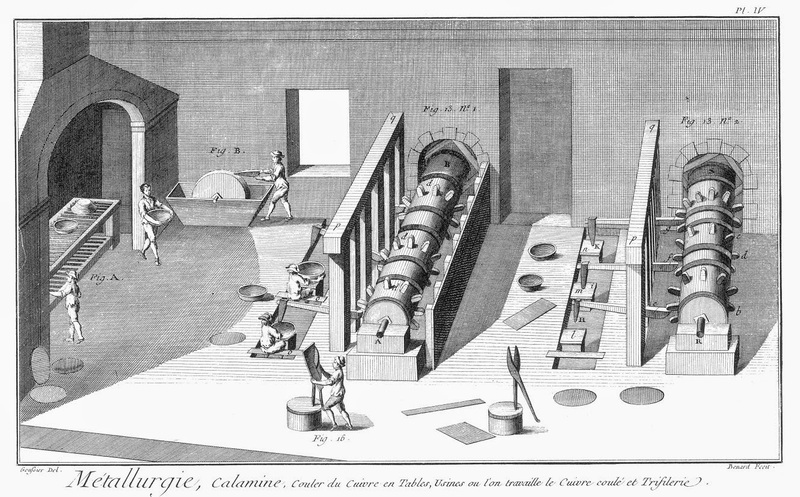 From Diderot's Encyclopedia, machinery to hammer brass into thin sheets. To this day in the field of glassmaking, color is still a subject about which manufacturers hold their cards very close to the breast. It is very unusual to coax anyone in this trade to speak freely about exactly what materials are used to produce a specific color and for good reason – competitive advantage. In this respect, attitudes have not changed very much from the early seventeenth century when Antonio Neri blew the doors open with his book of glass recipes. L'Arte Vetraria, discussed, for the first time in print, a whole rainbow of different shades in terms of specific materials and amounts. Since then, a number of his formulations have become obsolete or fallen into disuse. This has happened for no other reason than the raw ingredients he used are not easily obtainable or reproducible today. Since the state of industrial chemistry is far ahead of where it was in his time, the basic metal oxides are now simply ordered from a catalog and mixed to produce the maker's specific color palate their customers expect. The result is that many of the shades of color Neri produced have not graced the end of a gaffer's blowpipe for centuries; they certainly could be duplicated today, but there is simply no call to do so. One of the interesting raw ingredients that he used four hundred years ago is tinsel. Yes, this is the ancient relative of what we still use for holiday decoration. Neri advises, "Take orpiment, also known as tinsel and to save money purchase some that has already been used for decorative wreaths and garland." Tremolante is the specific word he uses; it has the same root as the English "tremulous" and "tremble." In modern Italian, it means to flicker or shimmer. The groundbreaking early dictionary first published by the Florentine Accademia della Crusca in the seventeenth century gives Neri credit for the first use of the term in this context, but if it was a common product, the word must certainly have been in use earlier. To confuse matters, Neri describes tinsel as a kind of "orpiment." (orpello) This term was also used to refer to arsenic sulfide, a highly toxic mineral used as a golden paint pigment, but in this recipe he uses the word only to refer to the golden color of tinsel. Neri's tinsel was made of brass, which is an alloy of copper and zinc. While zinc had been isolated as a pure metal, notably by Paracelsus, Neri knew it only by its oxide which he called zelamina. He cut the tinsel into tiny pieces with a scissors and then 'calcined' it, heating it in a covered crucible among live coals for four days. He was careful not to let it reach a temperature that will melt the metal. He removes it from the fire, grinds it into a black powder, then reheats it for another four days. By the end of Neri’s process both the metals would be oxidized. This product, he tells us, makes a blue color in glass reminiscent of the feathers of the "gazzera marina" bird, "holding the middle between aquamarine and the color of the sky when it is very clear and serene" There are several possibilities for the identity of the gazzera marina, the most likely seems to be the European Roller (Coracias garrulus). It is a species that is known for its striking appearance in flight; its brilliant blue breast contrasts against black flight feathers. In a second brass recipe (# 21), the snippings are mixed with powdered sulfur and heated in the live coals of the furnace firebox for a day. He then grinds it as before and reheats it for a protracted period of ten days in the hottest part of the furnace "near the eye." Neri advises that the product can be used for transparent red, yellow and in chalcedony glass. He uses calcined tinsel in two of his chalcedony recipes but we never see a further mention in the book for transparent red or yellow glass. In the first part of this recipe, the sulfur likely reacts with the zinc-copper alloy in the tinsel to form sulfides of the metals. In the second part, the sulfides are decomposed by the high heat to form oxides and most or all of the sulfur is driven off as noxious sulfur dioxide gas. This method could well produce better oxidation of the metals and therefore a better quality colorant. If the sulfides do not completely decompose, some interesting possibilities arise in the melt. Copper sulfides have the potential to be reduced to pure metal in a reheating maneuver done by the glass artist called 'striking.' This might produce the wonderful transparent red known as copper ruby glass. Zinc sulfides in glass, produces a white or opaline glass. The only way to know for sure what the old recipes would do is to make a batch and put it in the hands of an artist.